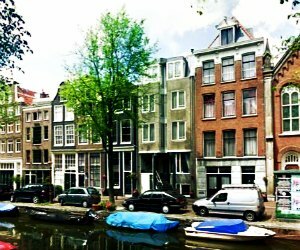 Looking for an affordable accommodation in Amsterdam? 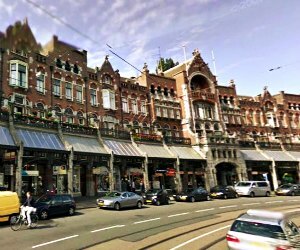 I've selected a list of the best budget hotels in Amsterdam with comfortable rooms and all the amenities you may wish to find for a low price. Room prices at these hotels start at approximately €30.00 per night. 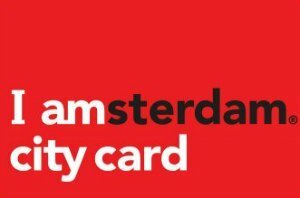 citizenM Amsterdam City hotel review: citizenM Amsterdam City Hotel is a hip, modern hotel. Although the rooms are small, they pack in a lot of functionality and amenities like extra large king sized bed, rain shower, mood pad for room control, safe, good quality linen, LCD TV and free WiFi. The hotel has a bar and a restaurant with several choices when it comes to breakfast. Located only 5 minutes walking distance from the airport, it has a convenient location though it is far from the center of the city. The hotel is suitable for couples and single travelers since no family rooms, extra cots or beds are available. WestCord Fashion Hotel Amsterdam review: WestCord Fashion is a 4 star hotel and a part of the well-known WestCord Hotels Group. Although the hotel is not located in the city center, it is located close to the tram station that makes it easy to travel throughout the city. The property is designed to be modern and the rooms are small but very clean and comfortable. The breakfast buffet is particularly good with a very large range of choices available. Other amenities on site include a Skyy Bar with good views, saunas, fitness, swimming pool, a steam room and a wellness garden. Free WiFi is also available. WestCord Art hotel Amsterdam review: WestCord Art Hotel Amsterdam is a part of the well-known WestCord Hotels Group. This is a 4 star hotel suitable for business travelers as well as couples. It is located 10 minutes from the city center with easy access to public transportation. The rooms are all quite spacious, clean and include some good features like spacious bathrooms, lounge sofa, free WiFi, flat screen televisions and modern design. On-site are a restaurant and a café serving lunch, dinner, drinks and breakfast. The staff is quite helpful and friendly. The public areas of the hotel feature modern design and a lot of artwork. 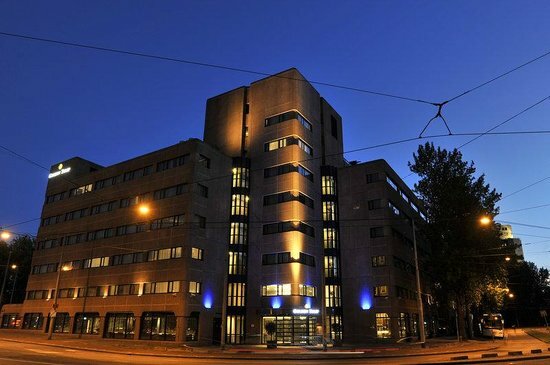 Best Western Blue Square Hotel Amsterdam review: The Best Western Blue Square Hotel is a part of the Best Western Group. 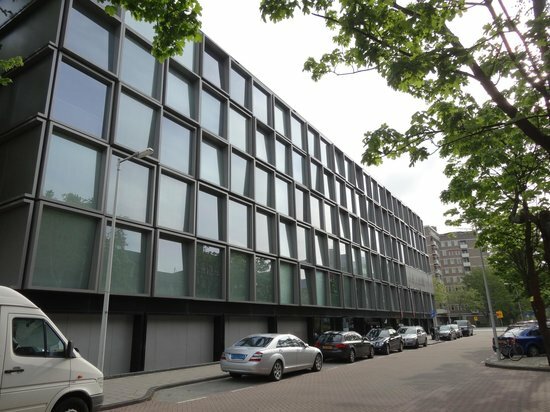 It is an eco-friendly budget hotel in Amsterdam with a Green Key Silver status. Although the hotel is located outside the city on the A10 exit, it is 15-20 minutes away from the city center. All rooms are air conditioned, soundproofed and have free WiFi, tea and coffee making facilities, flat screen TVs, a safe and a spacious bathroom with rain shower. Blue's Bistro is a restaurant in the hotel that serves a full hot breakfast, dinner as well as lunch. There is a bar in the hotel that serves a good selection of drinks. 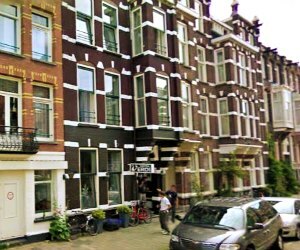 Hotel Keizershof Amsterdam review: Hotel Keizershof is a homely, family run B&B in the historic center of the city. 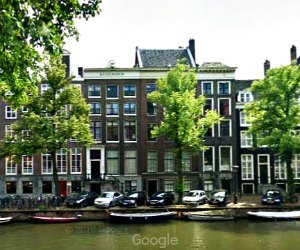 Located in an aunthentic 17th century canal house, this budget hotel in Amsterdam offers basic comforts without any frills but a lot of character and charm. There's a spacious garden behind the hotel where breakfast is served when the weather is nicer. The rooms include a coffee machine and a hairdryer, a flat screen TV and a shower. Some rooms have shared toilets in the hallway. As with older buildings in Amsterdam, the stairs are quite steep and there is no elevator. The room includes homemade breakfast. The hotel is located close to all the attractions in the city. Hotel Adolesce Amsterdam review: Hotel Adolesce is a family run 2 star affordable hotel in Amsterdam, located in the center of the city. Located in a traditional canal house, it is only a few steps from the skinny bridge and close to most attractions in city center. The rooms are cozy, very spacious and designed to be comfortable but simple. They feature large beds, telephone, TV, spacious shower and free WiFi. Most rooms at the budget Amsterdam hotel Adolesce offer large windows with beautiful views of the canal. There's a 24 hour buffet that serves free tea, coffee, fruit, juice, milk and other snacks. The proprietor as well as other staff members are very friendly and helpful. 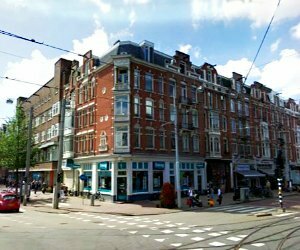 Hotel Verdi Amsterdam review: Hotel Verdi is a family style, 2-star budget Amsterdam hotel located in the museum quarter close to the Van Gogh Museum and Rijksmuseum. Bus and tram stops are all located close to the hotel. The rooms are practical, simple, clean and reasonably priced. All rooms include soap, towels, telephone and television. Other than the budget rooms, all rooms also include a private toilet and shower. The hotel also serves a large breakfast each morning that includes juice, milk, tea, coffee, cereal, cheeses, bread, eggs and fruit among other things. The staff is friendly, eager to help and is quite knowledgeable about the city. 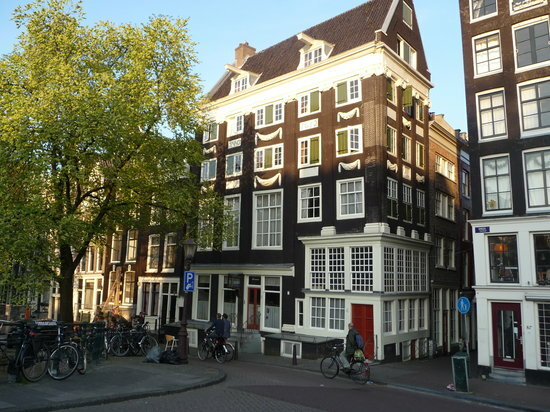 Hotel Aspen Amsterdam review: Hotel Aspen is a family-run budget hotel in Amsterdam, located in the center of the city, close to the Anne Frank house and the Royal Palace. The rooms in the hotel are quite basic with shared toilet and showers in the hallway. Rooms with private facilities are available for a slightly higher price. The room itself is quite basic but very well maintained and cleaned. Fresh towels and linen are provided each day. There are no kettles or televisions in the room. However, hot drinks can be purchased from the owner. The staff is very friendly, unobtrusive and happy to provide tips on local attractions. 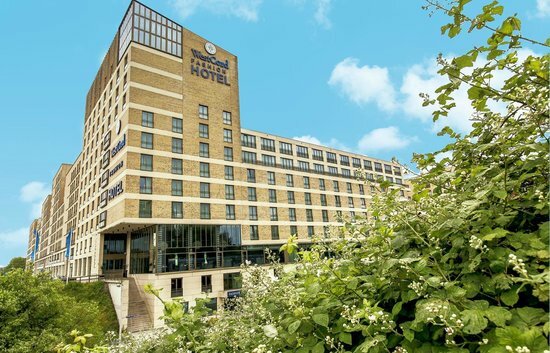 Golden Tulip Amsterdam West Hotel review: Hotel Golden Tulip is budget hotel in Amsterdam, located on the A10 and while it is far from the city center, public transportation is easily available. The rooms are comfortable, very clean but small. The amenities in the room include a Nespresso machine for tea and coffee, free WiFi, TV with plenty of channels, heated bathroom and shower. All rooms are also air conditioned and sound proofed. On site is a bar as well as a buffet restaurant that serves a good sized breakfast, lunch and dinner. It is a family friendly hotel in a quiet neighborhood and the staff is quite accommodating and helpful. Hotel Brouwer Amsterdam review: Hotel Brouwer is an budget Amsterdam hotel located in the city center on the Singel Canal. Housed in a historic building dating back to 1652, it is a family friendly hotel in operation since 1917. There are 8 rooms in the hotel and each one is different. 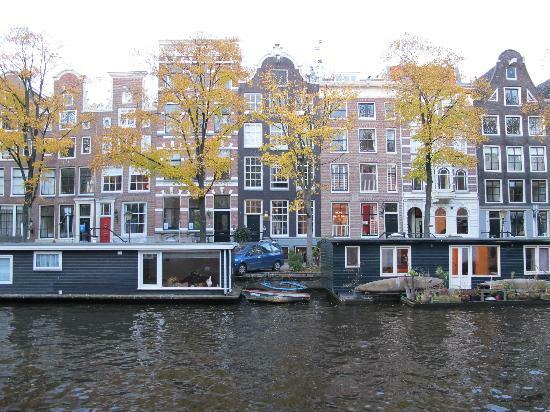 All rooms include a private bathroom, are non-smoking and provide a beautiful view of the canal. The rooms are large in size, cozy and kept very clean. The facilities inside the rooms are simple and basic. The staff is quite pleasant and the breakfast served is quite adequate. However, since it is located in a busy location, it does tend to get quite noisy. 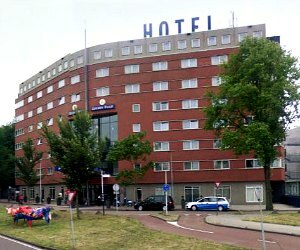 Abba hotel Amsterdam review: Hotel Abba is a budget hotel located in the center of the city and 5 minutes walking distance from the nightlife area. There are 36 rooms in the hotel that include televisions, and storage. Some rooms also include balconies and a telephone. The standard rooms have access to shared showers and toilets in the hallway. It is a smoker-friendly hotel, which might not be very comfortable for non-smokers. The hotel offers very basic, standard amenities but all rooms are kept very clean. Fresh towels and linens are provided every day. Free breakfast is also included in the price of the room. 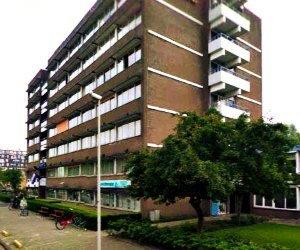 Hotel Abba is a budget accomodation in Amsterdam, with low room prices for budget travelers who don't mind sharing a bathroom. 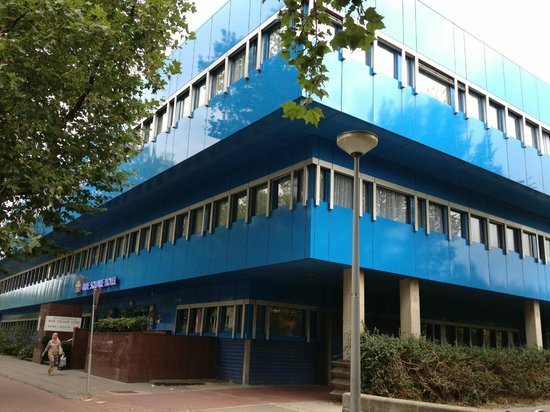 New West Inn Amsterdam Hotel review: New West Inn Amsterdam Hotel is a family-friendly three star budget Amsterdam hotel located in the Western part of the city. The hotel property features a terrace, garden, lounge and bar, fitness room and a restaurant. The rooms are very spacious and include a shower and bathroom, a desk, free WiFi, cable television and air conditioning. However, it is located 30 minutes from the city center. The breakfast buffet includes a good selection of hot and cold breakfast items. There is also a restaurant on-site that serves lunch and dinner. The staff is accommodating and helpful. Since the hotel is located in a residential area, the rooms are very quiet. van Onna Hotel Amsterdam review: Hotel van Onna is a cozy, family friendly budget Amsterdam hotel located in Jordaan, close to the Dam, the Royal Palace and all the tourist attractions. 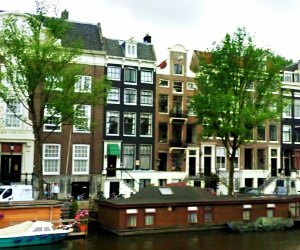 The hotel is placed in three traditional canal houses. There are 41 rooms in total, all with private bathrooms. The rooms are simple, practical and very clean. Some of the rooms come with a view of the canal. There is no television in the room but free WiFi and free continental breakfast is included in the price of the hotel. The staff is very friendly and the location of the hotel provides easy accessibility to various amenities in the city center. Hotel Orlando Amsterdam review: Hotel Orlando is a budget Amsterdam hotel, located close to the Amstel River in the center of the city. Most tourist attractions are located within a walking distance of the hotel. There are 7 rooms in the hotel and each room is unique in design and character. All rooms include box spring beds, private bathrooms, climate control, hair dryer, access to internet, television, safe and a mini-bar. The rooms are clean and well maintained and many come with a beautiful view of the canal. The hotel also offers a large continental breakfast, served in the breakfast room or delivered to guests in their room.